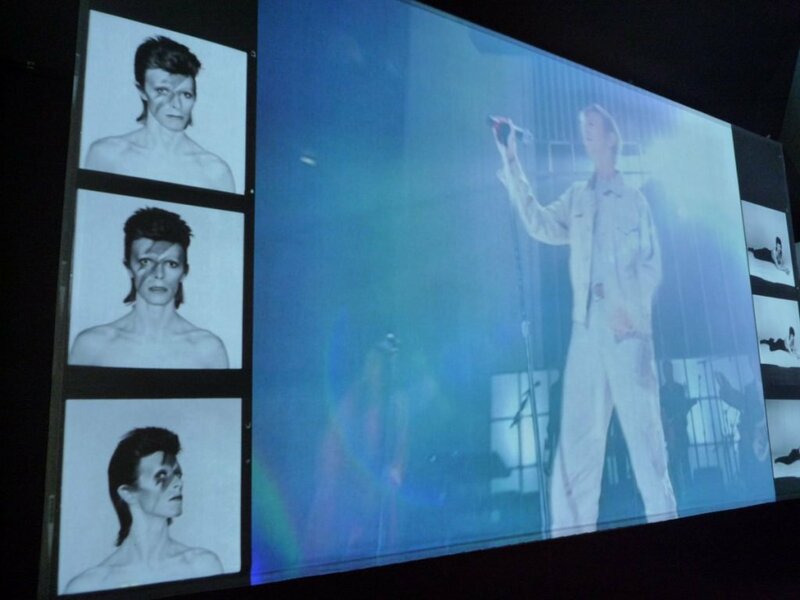 Since 2013, Bowie fans have been making pilgrimages around the world to see the extraordinary David Bowie Is exhibition, which first opened at the Victoria & Albert Museum in London. 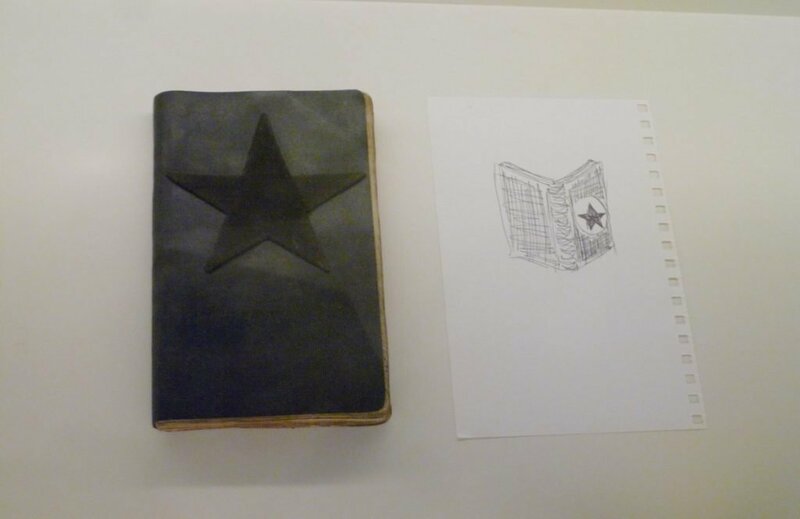 The traveling show has reached its final destination, the Brooklyn Museum—a gesture calculated to pay homage to New York, the city Bowie loved and lived in during his final years. I was invited to the press preview last Wednesday where a select group of journalists were granted exclusive photography access (the exhibition opened to the public on Friday and photos are prohibited). Seeing this show, quite frankly, was a religious experience for me. Before the original show opened in London, the V&A asked my friend and collaborator Camille Paglia to contribute to the exhibition catalogue. 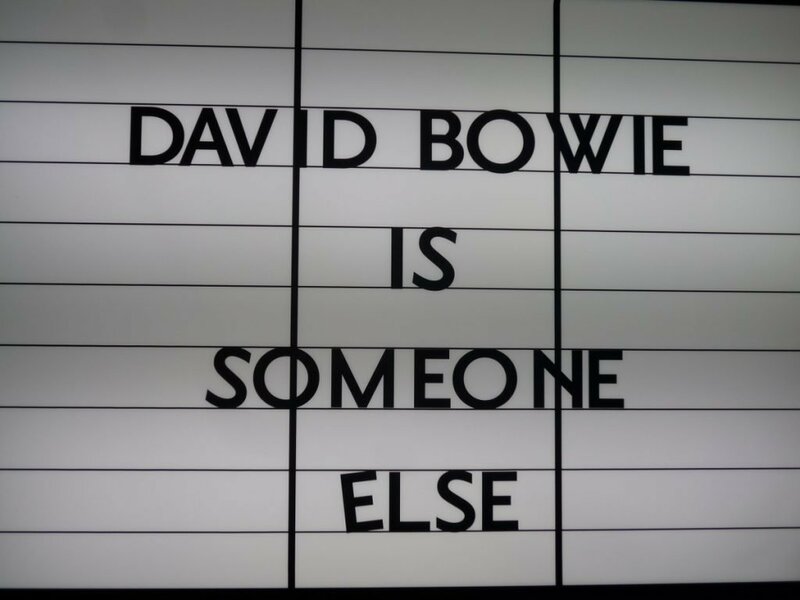 The result was her terrific essay “Theatre of Gender: David Bowie at the Climax of the Sexual Revolution.” I feel that this essay is the best way to talk about the exhibition, so every quote in this post is taken from Professor Paglia’s text. “David Bowie burst onto the international scene at a pivotal point in modern sexual history. The heady utopian dreams of the 1960s, which saw free love as an agent of radical political change, were evaporating. Generational solidarity was proving illusory, while experimentation with psychedelic drugs had expanded identity but sometimes at a cost of disorientation and paranoia. By the early 1970s, hints of decadence and apocalypse were trailing into popular culture. 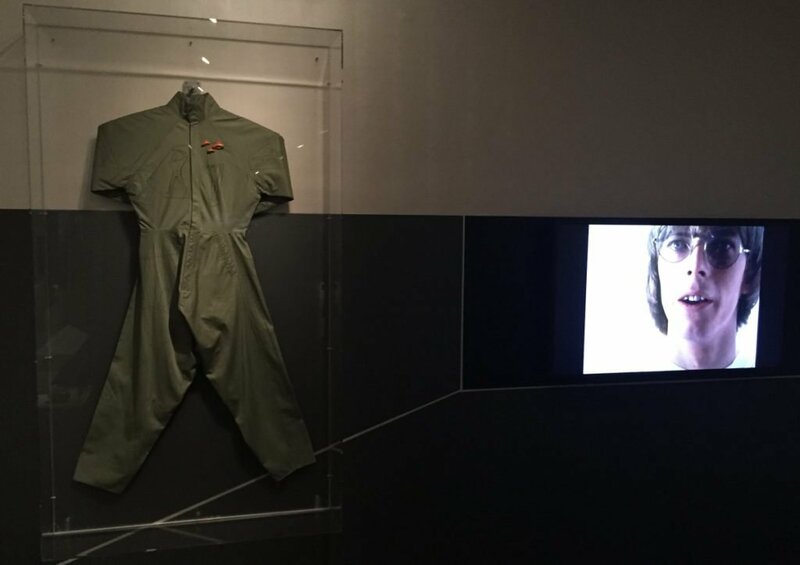 Bowie’s prophetic attunement to this major shift was registered in his breakthrough song, ‘Space Oddity’ (1969), whose wistful astronaut Major Tom secedes from Earth itself. Recorded several months before the Woodstock Music Festival, ‘Space Oddity’, with its haunting isolation and asexual purity and passivity, forecast the end of the carnival of the Dionysian 1960s,” writes Paglia. 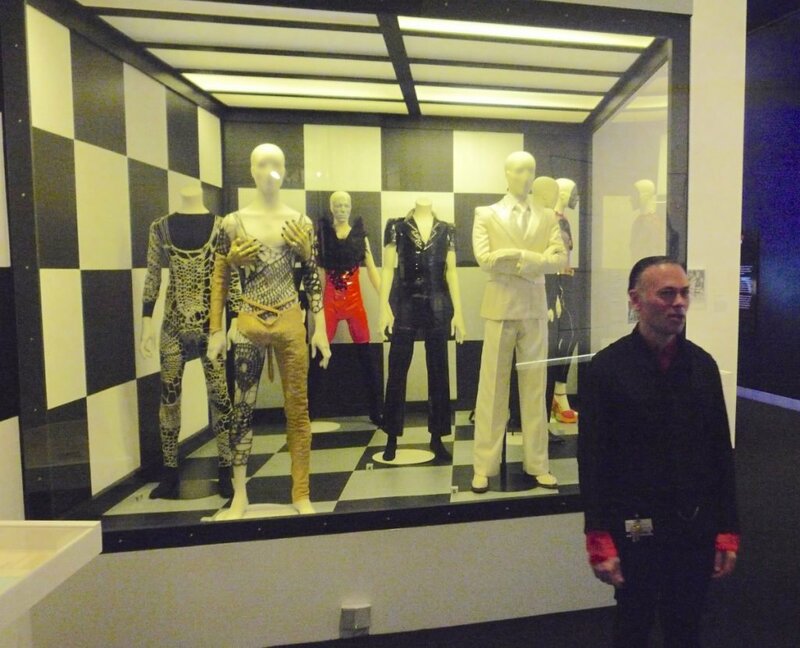 I was thrilled to see the costume Bowie wore during his Saturday Night Live performance in 1979, designed in collaboration with Mark Ravitz with the help of the great Klaus Nomi and Joey Arias, who both appeared with him onstage for the SNL appearance. The costume is modeled after the one designed by Sonia Delaunay and famously worn by the Dadaist Tristan Tzara (in the photograph above) during a 1923 performance of The Gas Heart, a key moment in the Dada movement. The performance ended in a riot led by André Breton, the future founder of the Surrealist movement. A variation of the Bowie costume went on to become one of Nomi’s signature stage looks. 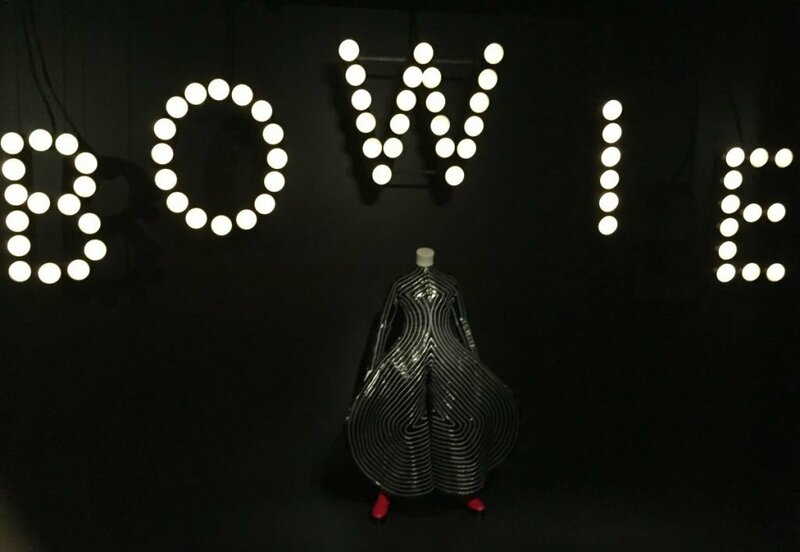 A restrictive column-shaped skirt was substituted for pants in the Bowie costume and, for dramatic effect, he had to be carried out onstage by Nomi and Arias. 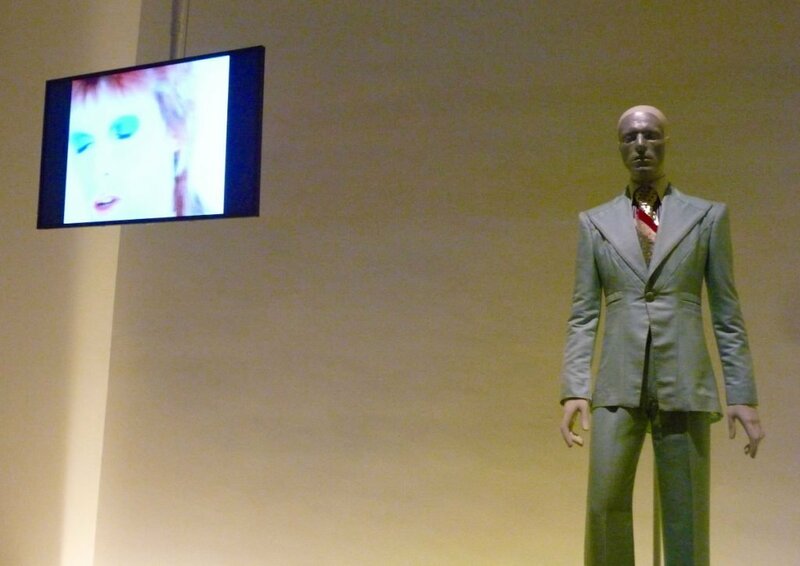 “The Surrealists, who emerged from Dada, seized on the fashion mannequin as a symbol of modern personality—assertive and hard-contoured yet empty and paralysed. They were partly following the precedent of the Metaphysical painter, Giorgio de Chirico, who showed genderless tailors’ dummies marooned in twilit deserted plazas. (Bowie explicitly voiced his admiration for de Chirico and later replicated his work, as well that of the Surrealist René Magritte, in the hallucinatory sets for the 1985 video of ‘Loving the Alien’),” writes Paglia. “Bowie’s genius for using the camera as others use a paint brush or chisel—not from behind the camera but before it—was dramatized in The 1980 Floor Show, his last appearance as Ziggy Stardust. This cabaret-structured program was recorded over three nights in October 1973 at the Marquee Club in London and was broadcast on American TV the following month.” writes Paglia. 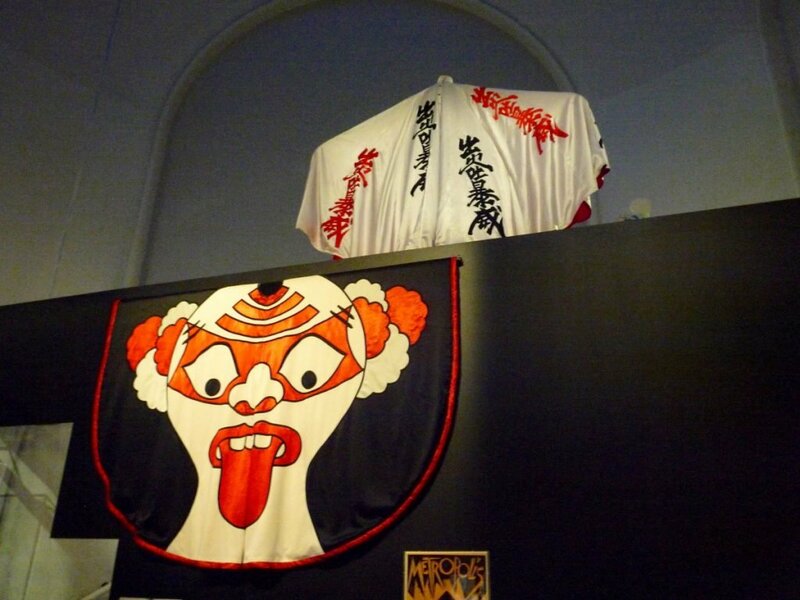 Pierrot costume, 1980, designed by Natasha Korniloff for the “Ashes to Ashes” video and Scary Monsters (and Super Creeps) album cover. 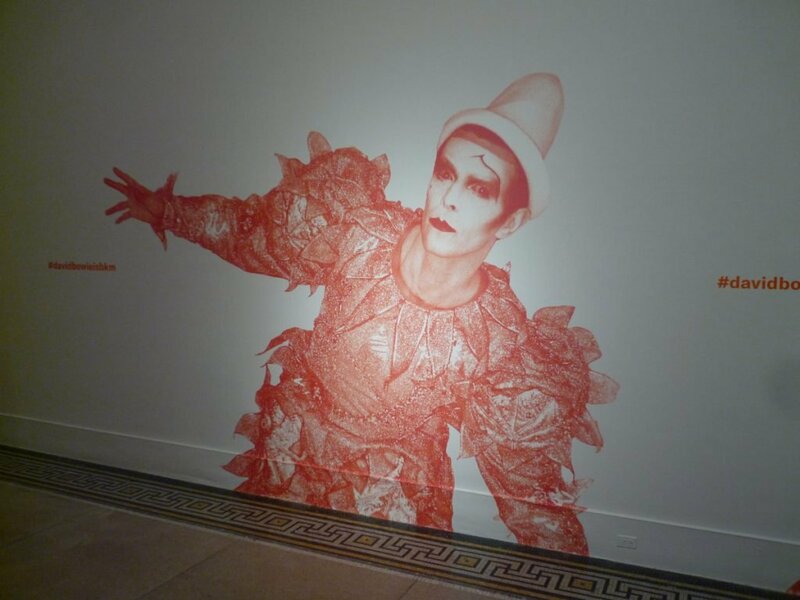 “Bowie’s Pierrot, wearing a tufted white clown costume and dunce cap, has a gangly awkwardness and a timid, pre-sexual innocence,” writes Paglia. 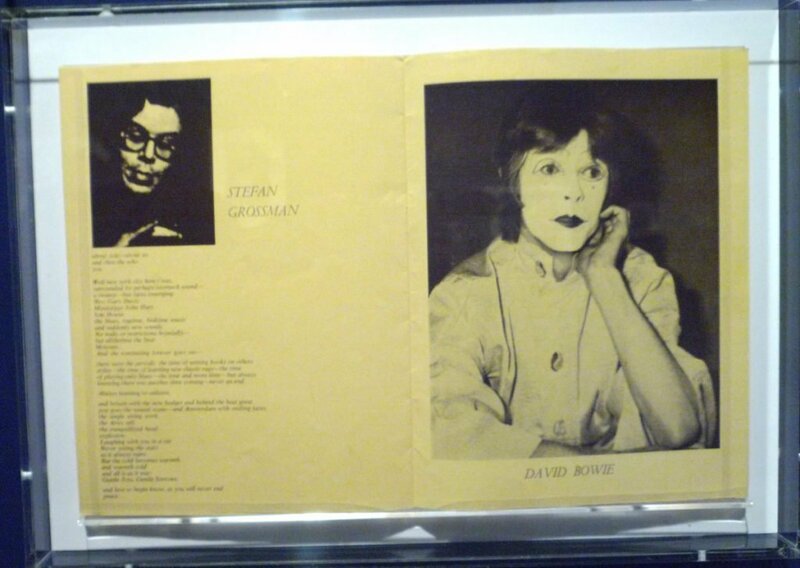 “Bowie has rarely spoken publicly of his mother and, in the 1970s, curtly rebuffed prominent British and American TV interviewers when they presumptuously prodded him about it. 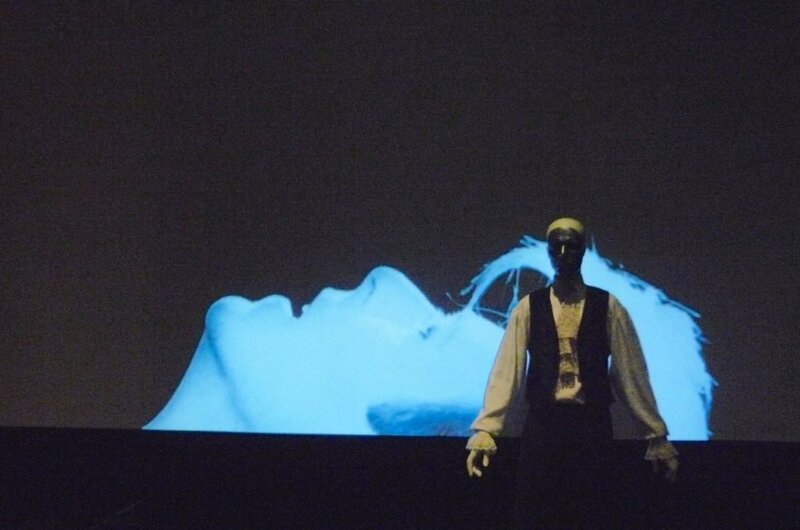 The finale of ‘Ashes to Ashes’ addresses the matter in dramatic symbolism, like the depressed film director Guido’s dream encounter with his parents in a cemetery in Federico Fellini’s 8 ½. Hectored by a small, gesticulating older woman, whom Bowie said (when introducing this video for a 1993 MTV retrospective) resembled his mother, Pierrot strolls with abashed attentiveness and dutiful resignation along the edge of an infernal underground sea. Cage shoes from the “Dead Man Walking” video. 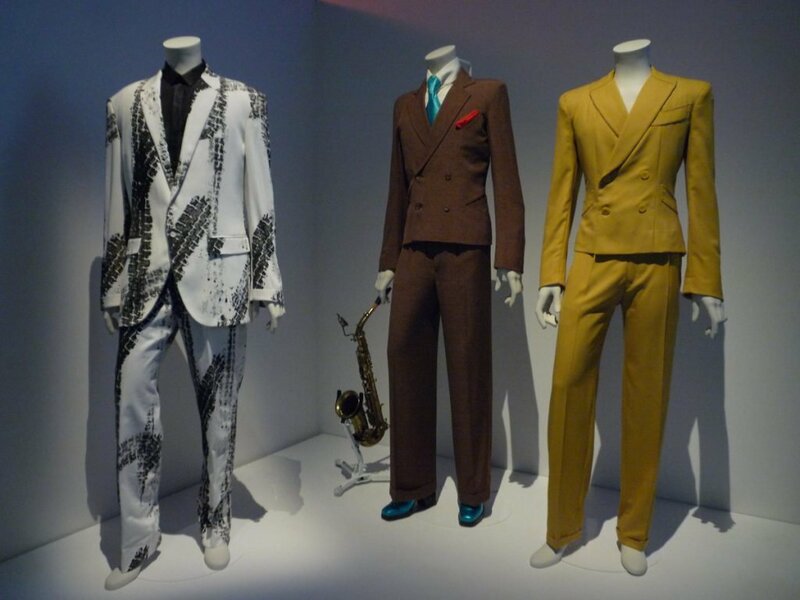 The Brooklyn Museum show features a few pieces that did not appear in the V&A exhibition, including this suit that Bowie wore to the Grammys in 1975. One of the famous photos from that night at the Grammys, featuring Simon and Garfunkel, Yoko and John, and Roberta Flack. 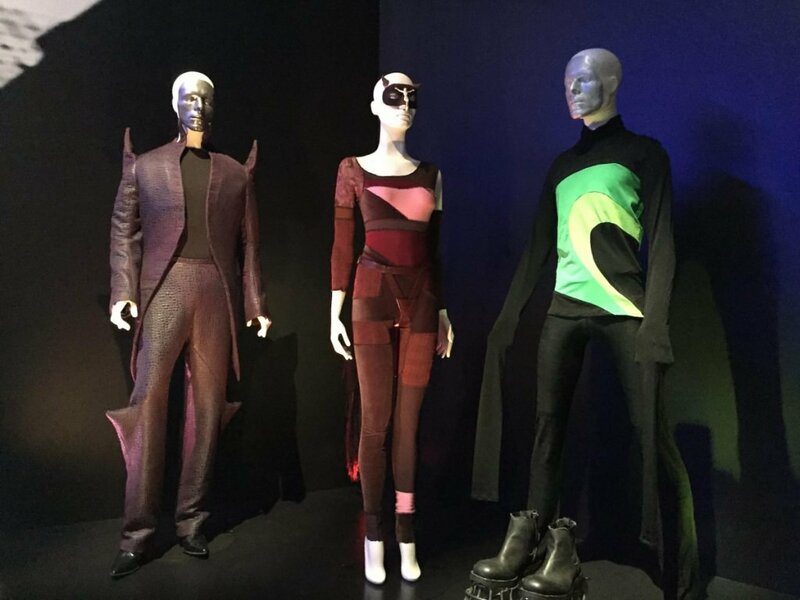 The Brooklyn Museum’s soaring ceilings are a nice complement to the extraterrestrial nature of some of the costumes. Quilted suit, 1972, designed by Freddie Burreti for the Ziggy Stardust tour. 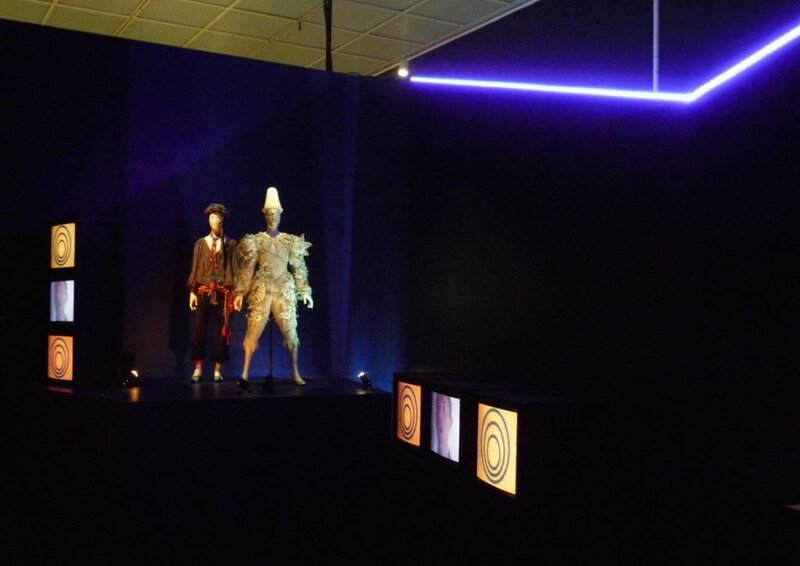 Costumes designed by Kansai Yamamoto, 1972–73, for the Aladdin Sane tour. Union Jack coat, 1997, designed by Alexander McQueen and David Bowie for the Earthling album cover and tour. Costume worn during the performance of “TVC 15” on Saturday Night Live in 1979. Quilted suit, 1972, designed by Freddie Burretti for the Ziggy Stardust tour. Angel of Death red vinyl costume with marabou and paillettes, 1973, designed by Freddie Burretti for The 1980 Floor Show. 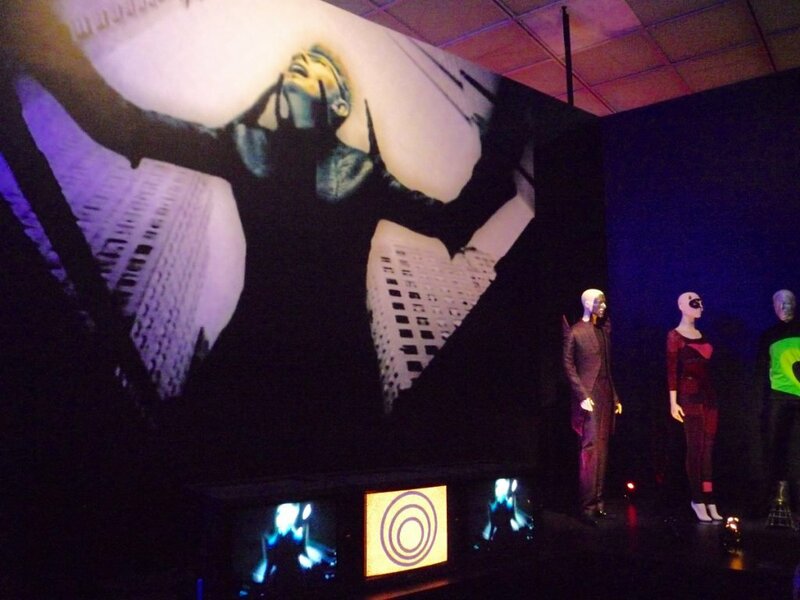 Black suit and dress shirt, 1976, designed by Ola Hudson for the Station to Station tour. 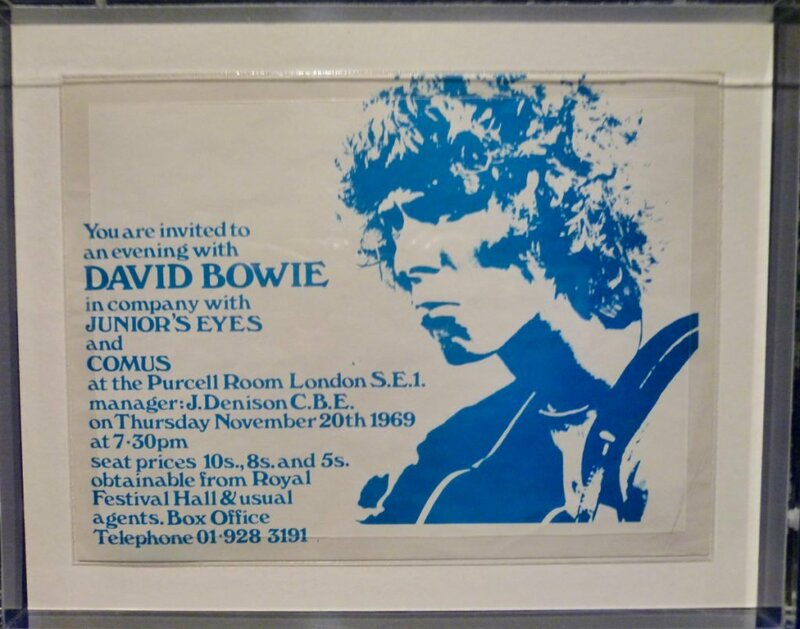 Painting by Bowie, done while he was living in Berlin in the late 1970s. This made me laugh, in light of the recent transgender bathroom drama. Thank you for reading and I hope you can make it to the show.